Published: March 13, 2019 at 05:15 p.m. Updated: March 13, 2019 at 05:35 p.m. Mind Boggling Stats: Odell Beckham Jr.
Odell Beckham Jr. played college football at Louisiana State University (LSU), and was drafted by the New York Giants in the first round of the 2014 NFL Draft with the 12th overall pick. Since then he has outperformed other wide receivers ranking at the top or in the top 5 in each major receiving category since entering the NFL in 2014. Odell Beckham Jr. and Antonio Brown, who each rank in the Top 3 in receiving YPG. Beckham Jr. has 92.8 receiving yards since 2014. 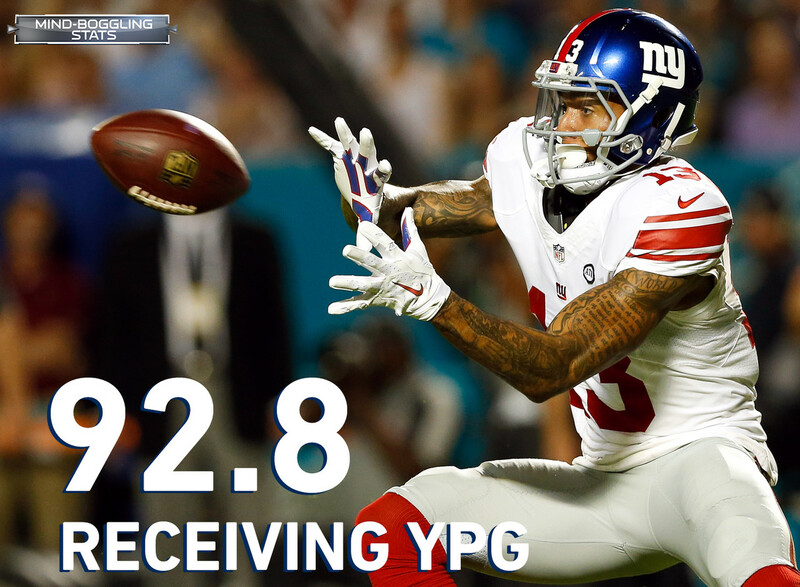 Odell Beckham Jr. ranks in the Top 5 in each major receiving category since entering the NFL in 2014. Targets/Game with 10.5 - rank 3rd. Receptions/Game with 6.6 - rank 4th. Receiving YPG with 92.8 - rank 3rd. Receiving TD with 44 - rank 3rd. Odell Beckham Jr. is the only player in the Super Bowl era with two seasons of 1,000+ receiving yards in 12 or fewer games. Season 2018, 12 games at 1,052 yards. Season 2014, 12 games at 1,305 yards. Only Julio Jones has more receiving yards in his first 60 career games than Odell Beckham Jr. in the Super Bowl era. Beckham Jr. (59 games) needs 100 receiving yards to pass Jones for the most receiving yards in a player's first 60 games in the NFL. Beckham Jr. has three career seasons receiving TD (2014-2016) with 1,000+ receiving yards and 10+ receiving TD (2014-2016). No player has had more success vs. the AFC North than Beckham Jr. since 2014. Averages 128.8 rec YPG vs AFC North opponents (most in NFL).